A Houston man recently filed suit against his doctors and a medical device company after a routine surgery left him with an infected wound, full of maggots, allegedly caused by the faulty use of a defective medical device during his surgery. Continue reading for details about the case, and contact a dedicated and qualified Houston medical device defect attorney with any questions. A patient in Houston went to a medical office complaining of foot pain. He was recommended to a “competent podiatric surgeon” for examination. After diagnosing the man with a simple bunion and hammertoe, the podiatrist recommended surgery. The surgery involved a bunionectomy and implantation of medical devices sold by Extremity Medical, LLC, called the “Hammer FIX,” as well as other hardware supplied by the surgery center. The mundane story then turned to horror. After the surgery, the man developed further pain in his foot and went to the emergency room of a nearby hospital. He was examined by the same podiatrist, who discovered that the man had developed a severe infection in his foot. The wound was full of infected skin and tissue and, more alarmingly, living maggots. According to his medical reports, the infection resulted from multiple different infectious agents in the man’s foot. His examining doctor noted that the infection was “due to other internal orthopedic prosthetic device, implants and grafts…” After a week of emergency surgery and procedures, the doctors were able to remove the infected medical apparatuses, the maggots, and the infected, necrotic tissue. After the severe infection and nearly losing his foot, the man brought suit against the manufacturers of the medical implants as well as his podiatrist and the surgery center that provided the additional unsterile materials. 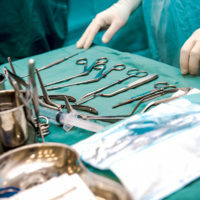 The lawsuit alleges that the infection was caused by the implantation of unsterile medical devices. The man claims the infection could only have been caused by the use of unsterile medical implants, either as provided by Extremity Medical, or as cared for and later used by the surgery center. The lawsuit seeks damages of more than $200,000 but less than $1 million. If you or a loved one has been injured by the use of a defective medical device, contact the skilled and compassionate medical device defect attorney and registered nurse Carolyn St. Clair to evaluate your claims and ensure you get the compensation you deserve. For a free consultation in Houston or nationwide, call 800-814-4540.